The Life of Mo: "hey, stop taking my picture! I'm trying to cool off here!" "hey, stop taking my picture! I'm trying to cool off here!" Before I went out to the grocery store this afternoon, I noticed that I couldn't find Rainey anywhere in the house. I called his name a few times, but figured he must be sleeping under the bed or something. After I got back from the store, I thought it was strange that he didn't come out when I came in the door. I called his name and looked under the furniture, but still didn't see him. I was starting to worry he had gotten out while I was sweeping the porches this morning, but I walked back to the kitchen to put away the groceries. I was reaching for the celery when I saw a little kitty face at the back door. 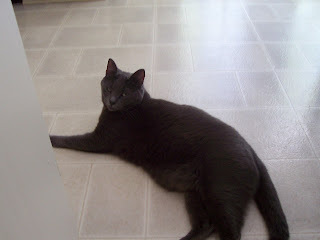 He looked desperate - it's pretty hot today - and he ran right in and sprawled on the cool kitchen floor. I guess that's what he gets for sneaking out! Poor Rainey!! Hugs and Kisses from Dassa.